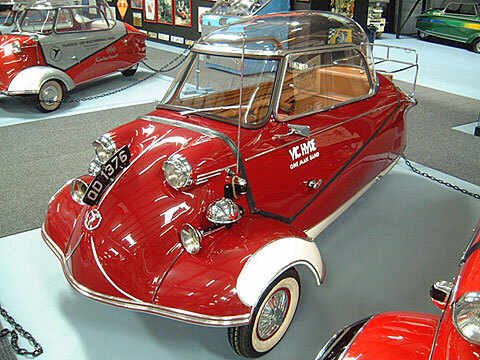 Already in January 1954, the search was on for a replacement motor for the 175 cc. Specifications for the new 200 were discussed by June, and production drawings ready by September. This well-known car dates from the pre-production period of winter 1954, and features interesting detail variations such as 175-style yellow ochre primer. It was given to American circus entertainer and personality Vic Hyde by the factory for publicity purposes, and was fitted out to hold his musical instruments. He toured Europe and America with it. This car has been restored by the Museum. The Pilot's cap on the seat was worn by Vic Hyde while he drove his cars and was donated to the Museum. 3 Wheels: 4.00 x 8"